The most addictive games on mobile phones take a simple storyline and put it as the backdrop for cool characters, good art and fun gameplay. It’s what makes Angry Birds so addictive. And Majesco Entertainment looks to use this formula for its new shooter-defender game, Romans From Mars. It’s got all the elements in place and has topped it off with one delightful addition: the game is free to download and play. But like many free games, it has a bunch of things you can buy in-game. Does that sour the experience or does Majesco have a winner on its hands? The story of Romans From Mars is explained in three panels. 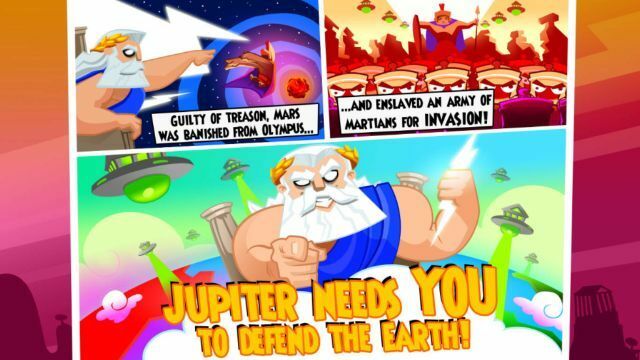 The God of War, Mars, was cast banished from Olympus, so he enslaved an army of Martians and is attacking Earth. It’s up to you to defend the realm. For this, the God of Thunder Jupiter has granted you, a lowly Roman soldier, magical powers and an enchanted bow. Simple, yes, but it’s a bit annoying that the developers skipped their basic research here, mixing up the Roman and Greek mythologies (Olympus doesn’t feature anywhere in Roman mythology). 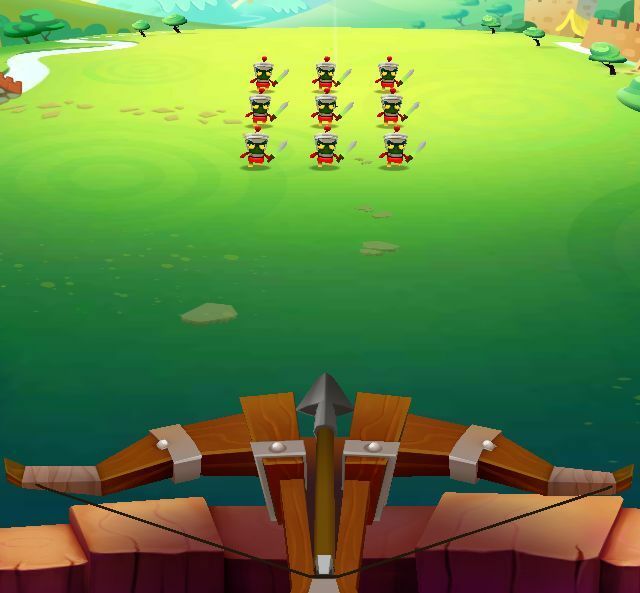 The game is played from a first-person perspective, where you are sitting at a wall with a crossbow. Off into the distance, spaceships drop off Martians who come running at you, and you have to kill them before they can get to the wall. The game takes on a cartoony look with bright colours, and has the hand-drawn appeal of old cartoons. In fact, the main characters — the Martians — immediately reminded me of a classic cartoon character: Marvin the Martian from the Looney Tunes world. Much like him, these Martians are also dressed up in a Roman soldier’s garb, but they do look a little meaner. While the graphics are a treat for the eyes, the sound department leaves a lot to be desired. There’s a faint background score that tries to marry cliched thematic sounds of sci-fi and historical films with a horrible end result. Plus, this is drowned out by the cartoonish grunts and squeals of the Martians or the explosions of your arrows. You might as well play Romans From Mars on mute. Where the game shines is when you actually start playing it. As wave upon wave of Martians comes running towards your wall, you have to fire your arrows to kill them. These are exploding arrows, so their impact on the ground has a blast radius of sorts. 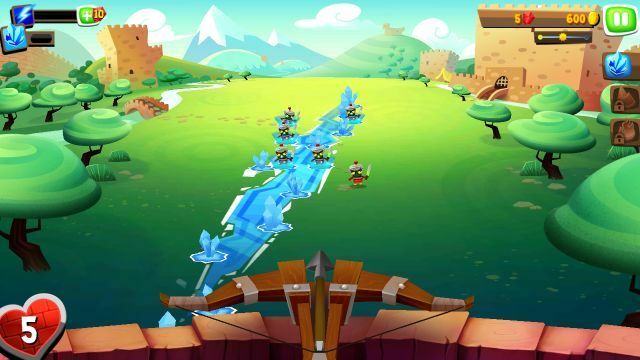 Thankfully, aiming is as easy as tapping on the screen rather than an elaborate “pull back the bow and set your trajectory” mechanism as per Angry Birds. It’s pretty important because Romans From Mars is about killing the Martians as fast as possible. You lose one health point for each Martian to get to your wall, and make sure you don’t go down to zero. As you progress, the enemies become more varied, showing up as stronger centurions which require two hits or jet-pack-toting flying Martians who come at you really quickly. To tackle these guys, you are going to need a little more than just your crossbow. As you defeat Martians, you earn Mana, which can be spent to cast spells of fire, ice or earth to stop the enemy in their tracks or defeat them. There’s a separate bar for lightning, which takes longer to fill up, and understandably so since it’s a far more powerful spell. 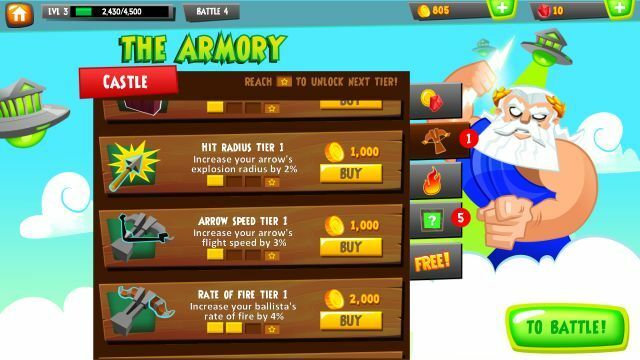 Kills earn you coins and gems, which you can trade at the end of each level to upgrade your bow or buy add-ons and power-packs, like fortifying your wall or filling up your mana bar. And this is where the in-app purchases make an appearance as well. If you want a shortcut to having a powerful arsenal, just buy it off the store! Personally, I don’t think it’s really worth spending real money as the game never really gets that difficult. You never require more powerful weaponry than what your regular progress will have gotten you. The gameplay is addictive, especially as you level up and your enemies get more challenging. And what’s really cool is that each level doesn’t take much time at approximately 3 minutes per level, which makes Romans From Mars one of those games that double as quick stress-busters. It’s free, it’s fun, and it should be on your Android device, along with the other best Android games. Romans From Mars is also available for iOS.